Photograph of Private William Brabiner. With many thanks to John Sheen, from his personal collection. From West Hartlepool, served with 22nd (Pioneers) & 18th (Durham Pals) Battalions DLI. William Brabiner was born in Stockton-on-Tees, County Durham, but moved to Hartlepool when he was a child. He was still living there with his family in 1911. 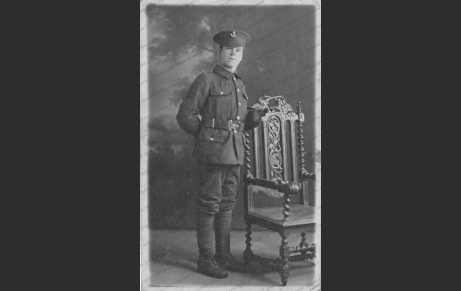 He enlisted with the 22nd Durham Light Infantry (DLI) and served with this battalion in France. He was later posted to the 18th DLI, went back to 22nd and was finally sent to 1/7th DLI. Before the end of the war Brabiner was promoted to Lance Corporal. In 1919, he was transferred to Class Z Reserve.